Once every so often, a blogger somewhere asks if it’s possible to recognize how good a book is without liking it. I think we’d all agree that a book can be good even though it does not fit our own personal taste. At least in theory. But when the rubber hits the road, or the fingers turn the pages, could you praise what is praiseworthy and write a good review about a book you didn’t like? The Beauty of Men by Andrew Holleran contains some of the best writing I’ve read in a while. Mr. Holleran takes the reader into the lives and psyches of his characters with an empathetic touch bringing them to life with honesty and with understanding. He neither judges nor asks us to feel sorry for the people he portrays. His words are straightforward enough to cut to the quick, but writerly enough to be lyrical when lyrical is called for. 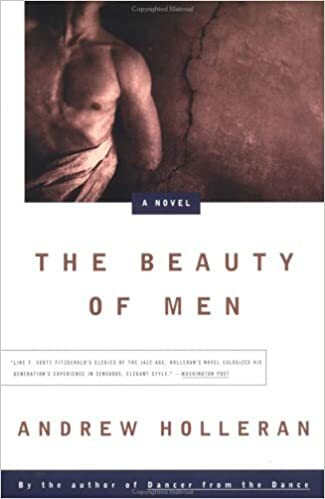 The Beauty of Men is about Lark, a 47-year-old single gay man, who has moved to Florida to help care for his mother who became paralyzed after a fall. At times he has to remind himself, She fell, I didn’t. But it doesn’t matter. She fell on him. All accidents on a certain scale, he noticed early on, sitting in the waiting rooms of intensive care units, affect not only the person who had the accident, they affect the person’s family as well. “She’d be better off dead!” his cousin said the evening she visited his mother for the first time after the fall; he wanted to slap her, for saying precisely what they could not allow themselves to think. “Would you rather have died the night you fell?” he recently asked his mother. “Oh God, yes!” she said in a loud croak. So much for the twelve years. They were victims, all of them, of Technology–she’d been on her way out of Life, in a revolving door, and been caught when the door stopped–she’d been stepping into Charon’s boat to cross the river Styx when she was pulled back, one foot in the boat, one foot on the bank. Death had been devouring her and dropped her to the floor, like a dog distracted by other prey, mangled and crippled and sore. Ironically, his mother’s injury allowed Lark to escape a world full of death. The novel is set in the mid-1980’s when AIDS was ravishing a generation of gay men in New York City where Lark was living. Now, Lark lives alone, has few friends, but he can blame this on his move to rural Florida. Had he stayed in New York he would be just as alone for a different reason. Now, instead of going to clubs and bath houses, he goes to the boat ramp and the one local gay bar two towns over in Gainesville. There are no happy campers in The Beauty of Men. Maybe one. Lark’s friend Eddie who frequents the boat ramp almost daily without any illusions of romance. Eddie is older than Lark but he has none of Lark’s maudlin attitude about age. He knows what he is, has accepted it, and goes through life with neither illusion nor self-pity. Lark on the other hand is obsessed with age. He has survived the AIDS epidemic only to find himself too old to be the gay man he wants to be anymore. The old become invisible, which is true in the straight world, too, but invisibility for older gays in the 1980’s was compounded by a community that valued both youth and beauty as signs of good health. Lark is still interested; he just can’t find anyone who reciprocates. We are the same age, Lark and me. Knowing something of what he feels did not make me like The Beauty of Men more. Maybe the 1980’s is not long enough ago. If the novel were set in the 1940’s, I could have felt more for Lark. But so close to our own time, I lost patience with him early on and never really came around to his side. I can’t say if the issues the book raises have been resolved or if we’ve just moved on to other things, but it all felt a bit old-hat to me. So am I recommending the book? I can say this: It is so well written that I will be reading more of Andrew Holleran’s novels. I’ve never read his classic Dancer from the Dance which is considered a seminal work in the LGBT Cannon. When I next see it on the shelf in a used bookstore somewhere, I’ll buy it. In the end, The Beauty of Men is an excellent work. One of the nice things about moving all of my old reviews over to this newer blog is that I have an excuse to re-read them all again. I remembered this book, I see the cover and the title in local bookstores frequently, but I had forgotten all about it. This review brought it all back. I imagine my opinion would be the same were I to read the book today. It’s too much of its time, too much a piece of history. I like to see what the author might write if he told this story today. He’s very good, Mr. Holleran. And I will admit that I have still not read Dancer From the Dance. One thing I’ve really taken away from book blogging the last few years is just how subjective reading can be. My enjoyment of a novel, independent of how great it may be, can change dramatically with my mood and environment. I thinks it’s a little odd, and kind of wonderful, just how hard we take it when someone doesn’t admire a book we love. I really feel it on a very personal level, though I know it has nothing to do with me at all.